Today we have 21+ links to everything AIRPLANE! We’ve got making planes, ideas for pretend play, airplane related arts and crafts, travelling tips for taking kids on planes, airplane themed learning ideas, and even airplane party ideas! 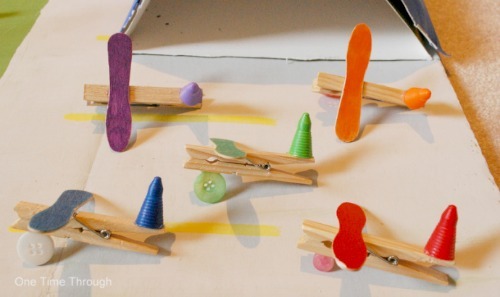 One Time Through made some colourful Clothes Peg Planes for play in a Cardboard Airport. This one was made with a giant clothes peg found at the dollar store. We also made a lot of Mini-Airplanes to fill up our Airport! 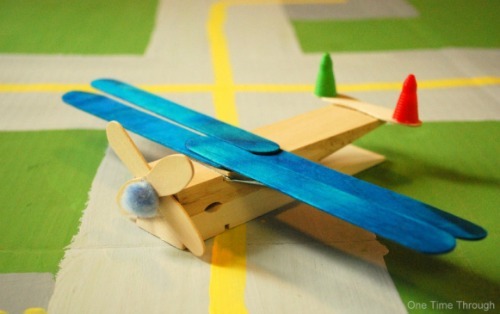 Here are some other FANTASTIC airplanes to MAKE with the kids! 1. Powerful Mothering has a super-shiny, fun to fly Airplane Junk Model. 2. Life With Moore Babies has some handy basic instructions for Folding Paper Airplanes with great photos to help! 3. Preschool Powol Packets has these adorable Craft Stick Airplanes that are perfect for preschoolers and so much fun to decorate! 4. Momdot got thrifty and creative and repurposed old match cars into Clothes Peg Airplanes that roll! 5. 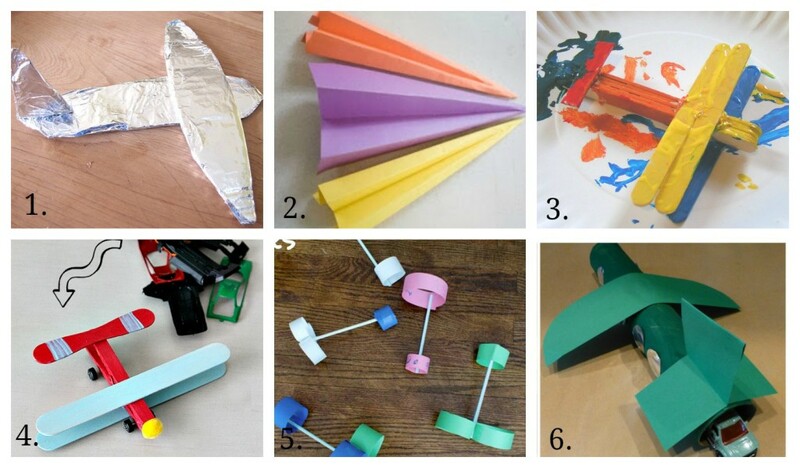 Make these super-flying paper-loop Straw Airplanes using a Pea Pod Labs visual tutorial. 6. Craftulate made really cute Cardboard Tube Airplanes that kids can paint any way they like! 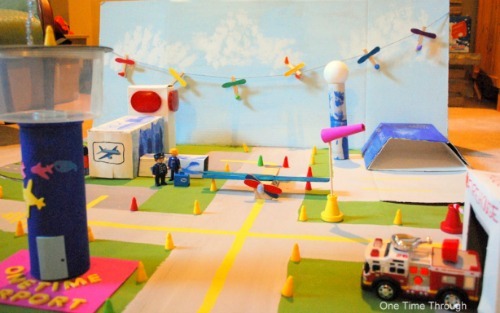 After constructing all these awesome airplanes with your kids, try making this fun Cardboard Airport for hours of imaginative play from One Time Through. Here are some other AWESOME ideas for pretend airplane play! 1. If your child wants some more air time for their planes, try making these fun Airplane Wire Hangers for target practice from Teach Beside Me. 2. I love this Airplane Runway that you can make in a matter of minutes for pretend play with your little one from Dirt and Boogers. 3. Homegrown Friends has some terrific ideas for helping your kids get ready for an Airplane Trip using pretend play. They’ve thought of everything including a cardboard box airplane! 4. Simple dramatic play can stimulate little minds and be so much fun! Check out this awesome post from No Time For Flashcards on how to Create An Airplane in your own living room with your kids, complete with boarding passes! Are your kids feeling crafty? Check out these adorable airplane ideas! 1. Make these adorable Airplane Crayons for colouring fun or for terrific party favours for an Airplane themed party from Nate and Rachael. 2. Another terrific and hands-on flight idea that can be used as a gift or party favour is this adorable Airplane Playdough Set from My Nearest and Dearest. 3. How about some Free Airplane Colouring Pages from Itsy Bitsy Fun that would be perfect for keeping hands busy on a long flight! 4. Here’s a super-easy Airplane Photo Craft for young kids from Artsy Momma that works on fine-motor skills and would make a neat memento of your child’s first flight! 5. If you haven’t gotten enough arts and crafts ideas, check out Hodge Podge Craft’s 10 Best Craft Ideas for Paper Planes for a nice roundup. Are you planning a flight with your kids like we are? Onetime is so excited to go on a plane for the first time a few weeks from now! Here are some great ideas for keeping kids busy on a long flight. 1. Here are some simple, but highly engaging Airplane Travelling Activities for Toddlers from Toddler Approved. 2. Another great post with tons of ideas for keeping little hands busy on a flight. This Portable Activity Kit for Little Travellers from Mama. Papa. Bubba. is full of lightweight games and activities that can all be stored neatly in a binder. 3. Still need more ideas? Cloudy With A Chance of Wine has created a collection of 20 Easy Travel Activities to Keep Kids Happy on an Airplane. Being a teacher, I can’t leave out the airplane learning activities. That would just be irresponsible! 1. Jello and airplanes. Cool! Kids Activities Blog created this really neat way to explain turbulence to kids and to help prepare them for flying. Check out: Airplane Turbulence Explanation and Activity. 2. Looking for some good airplane-related reads for kids? 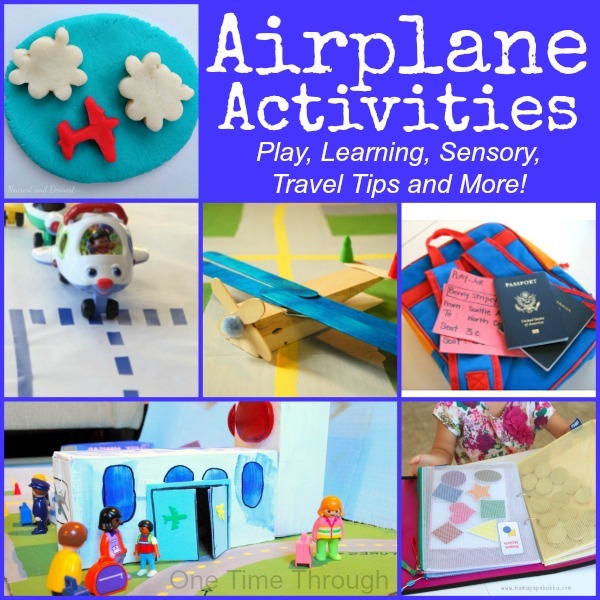 Check out: Airplane Books and Activities from Fantastic Fun and Learning. 3. Here’s a cute Paper Airplane Sight Word practice game for early readers at This Reading Mama. 4. There’s Just One Mommy has some fun ways to practise making the letter J as well as a cute jet-inspired Math game for early counting practise and a jet snack too in their post: J is for Jet. Find ideas here for food, decorations, party favours, and ways to remember the special day! 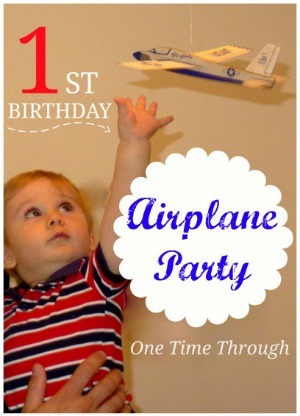 First Birthday Airplane Party. Looking for more tips for travelling with your little ones?